Manuscript Title: Roll of Carols. Physical Description: Roll. At the top is a much obliterated inscription in red in two lines. 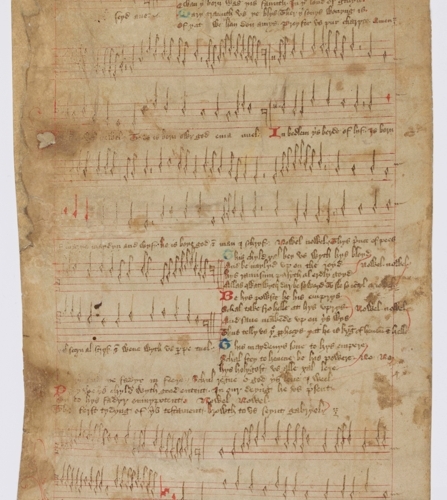 On the front of the roll are thirteen Carols in English with music on a five-line stave. Donor: Presented in 1838 by H. O. Roe, Esq. Size (inches): 6 ft. 7 in. long by 7 in. wide. The carols have been edited with a facsimile (of one section only) by J. A. Fuller-Maitland, M.A., and W. S. Rockstro (1891, Leadenhall Press). 1. Hail mary ful of grace. 3. Alma redemptoris mater. As I lay. 4. Now may we syngyn. 5. Be mery be mery. 6. Nowel syng we now. 8. Now make we merthe. 10. Qwat tydyngis bryngyst yu massager. 12. Prey for us ye prynce of pees. 13. Ther is no rose of swych vertu. On the back are some offices in a rather later hand. With Epistle and Gospel etc. Cibauit eos ex adipe frumenti. ad illudendum et flagellandum et crucifige(ndum). Deeming, H., Manuscript and Music : the Trinity Roll and its Carols [unpublished essay] 2 pts.